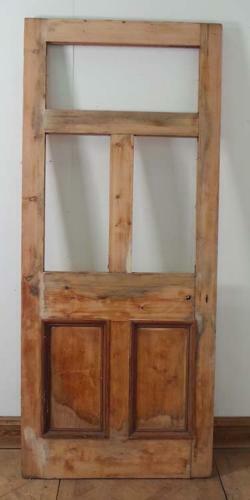 This lovely Victorian door is fully mortised and tenoned, and is suitable for external use as a front door. the door is constructed with one horizontal over two vertical panels fro glazing, over two vertical solid panels, fitted with chunky decorative mouldings to both faces. The door is in good original condition and has been fully stripped. The door is currently un-glazed, and will need to be fitted with modern toughened safety glass. Please contact us for options.